This week’s edition of The Wire Troll is filled to the brim with defensemen. Don’t be too quick to dismiss any of them — they just might save your season. Dan Girardi, D, New York Rangers (ESPN: 43.3 per cent; CBS: 33 per cent): With a 9-1 record in their past 10 games, the Rangers are currently the hottest team in the league, leading the Metropolitan Division with five points to spare at 32. Girardi, more of a stay-at-home defenseman, is making a serious case for himself to be on your Fantasy roster. Through 20 games played, he has two goals, eight points, a plus-12 rating, six penalty minutes, 17 shots on goal, 46 hits and 44 blocked shots. We hope you have better players on your team’s top defensive pairing, but Girardi will certainly do as a third or fourth defenseman. Oscar Klefbom, D, Edmonton Oilers (ESPN: 47 per cent; CBS: 48 per cent): Dead last (per usual) in the Pacific with seven wins and 15 points, the Oilers aren’t all that likely to make the playoffs this season. That said, the club has shown signs of life, and does have a remarkably bright future. 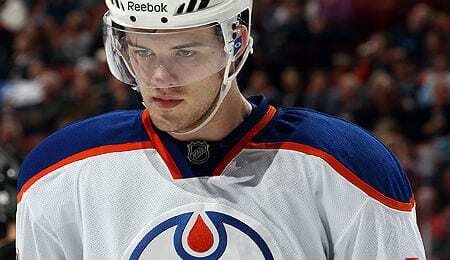 Those sunny prospects are finally starting to show on the Oilers’ blue line, thanks to youngsters like Klefbom. In 20 games, the Swede leads all Edmonton defensemen with four goals, 11 points, a minus-1 rating, six penalty minutes, three power play points, a game-winning goal, 28 shots on goal, 18 hits and 40 blocks, while also skating a team-best 21:48 of ice-time per game. Like Girardi above, you’re in trouble if Klefbom is the best defenseman on your Fantasy team, but he’s an excellent candidate for No. 3/4. And hey, he may be young, but Klefbom is already saying the right things (see video below). Tyler Bozak, C, Toronto Maple Leafs (ESPN: 34.5 per cent; CBS: 31 per cent): Bozak is on pace to best his highest single season total of 49 points. Through 17 games, he has three goals, 12 points, a minus-2 rating, six penalty minutes, a power play goal, 26 shots on goal, eight hits and 11 blocked shots. He’ll do quite nicely as a source of secondary scoring for your Fantasy team. Alec Martinez, D, Los Angeles Kings (ESPN: 18 per cent; CBS: 32 per cent): Another stay-at-home blueliner, the 2014 Cup-clinching goal scorer could be a steal on your league’s waiver wire. Through 19 games, Martinez has two goals, six points, a plus-5 rating, 12 penalty minutes, a power play goal, 31 shots on goal, 37 hits and 42 blocked shots. If your team is lacking in penalty minutes, hits and blocks, Martinez will help you out. Melker Karlsson, RW, San Jose Sharks (ESPN: 9.4 per cent; CBS: 12 per cent): Karlsson enjoyed a fairly successful rookie campaign with the Sharks last season, scoring 13 goals and 24 points in 53 games. An injury hampered him at the beginning of this season but, after getting back to his game with the Barracuda, the young winger looks good with three goals, four points, a plus-4 rating, two penalty minutes, 12 shots on goal, 12 hits and five blocks in six games played. While unlikely to replicate the success of fellow Pacific Division recall Leon Draisaitl, Karlsson should be on every Fantasy GM’s radar. Fantasy Tip of the Week: Fantasy owners in keeper leagues should be on high alert. The era of Shayne Gostisbehere has arrived in the City of Brotherly Love. The dynamic young rearguard has a goal, two points, a power play goal, 10 shots on goal and five blocks in four games since being recalled. The rookie is already fourth on the Flyers in scoring from the back end, as well as in ice-time with an average of 18:22. One would think Gostisbehere will be demoted at some point, but Philly is always looking for defensive help, and the youngster will assuredly be given every opportunity to eventually take on the role of No. 1. Dan Girardi Fantasy Impact: Are You Serious? June 23, 2014 | by Chris Wassel | Comments Comments Off on Dan Girardi Fantasy Impact: Are You Serious? How difficult is it to foresee what will happen in a player’s career several years down the road? It is incredibly challenging. However, these are the type of things that we just do anyway. The goal is to attempt to come up with a sort of possible projection with the eyeball test combined with some advanced statistics. Are you ready? Let’s go! Posted in Chris Wassel, HOCKEY, Player profile, Scouting Report | Comments Off on Dan Girardi Fantasy Impact: Are You Serious? Ladies and gentlemen, welcome to the machine. No no no, I mean the 2013 RotoRob Hockey Awards. This year we feature the usual awards, but then we go so far off the reservation that we had to call several doctors to yank us back to reality. No one said this would be easy so let’s try to tick off as many as we can with this year’s awards.